My name is Ben Tameling, and I am a Bible teacher at Grandville Calvin Christian High School. I am writing to express my enthusiasm for the Immerse: The Reading Bible series created by the members of the Institute for Bible Reading and published by Tyndale Publishers. For the first time this semester, I used the Kingdoms book for my Old Testament Survey class and the Messiah book for my New Testament Survey class. In both cases, it reinvigorated my teaching and my students’ approach to the Bible. What struck me so positively from this experience are the following three qualities. First, my students and I really appreciated and enjoyed the “user-friendly” format of Immerse. I had several students remark that reading the Bible this way felt less intimidating. As a Bible teacher who personally loves reading and studying the Bible, this comment blew me away at first, but then I began to see where students were coming from: all of the study notes, cross references, and footnotes in many well-meaning “study Bibles” end up distracting young people from actually reading the text itself. 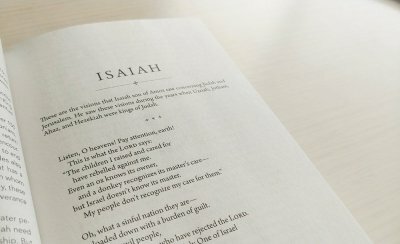 Reading both a large portion of the Old Testament and all of the New Testament using this format helped students focus on the grander narrative. The introductions to each book gave us helpful historical and cultural context for each book, but then we were off and running, uninhibited by the clutter of so many gigantic Study Bibles. Allowing students to “immerse” themselves in Scripture allowed me as a teacher to let students’ observations and reactions drive the class. Second, I enjoyed having student discussion lead the class rather than my own preconceived agenda. I still did and do a lot of planning, whether it be formulating “unit maps” to help introduce major concepts in biblical books, summarizing key learning targets, or putting together “recaps” to help students review together, to name just a few things. But allowing students to “immerse” themselves in Scripture allowed me as a teacher to let students’ observations and reactions drive the class. As their guide, I encouraged them to ask questions continually as they read and for them to share those in small groups, whole class discussion, and in their weekly journal reflections that I required. This last technique was a great way for me to keep up with students as they read, dialoguing with them along the way and prodding them to keep asking great questions as they sought to connect the dots throughout the Story. In short, it was fun to explore a balance between pouring a foundation for them to build off of and then letting them go to work as they read and shared their own perspectives. Third, going along with the above points about the user-friendly format and the student-driven dialogue, I believe using Immerse has allowed students to work toward a more holistic understanding of the Bible rather than see it as a series of disconnected “devotional chunks”. In my experience using Kingdoms, students could now approach the account of the Israelites entering and then exiting the Promised Land as part of a Story, more like an absorbing, tragic novel rather than a tedious textbook. Likewise with Messiah: suddenly all of the teachings and miracles of Jesus flowed together into a discernible storyline conveyed similarly yet differently by each Gospel writer. And rather than rush as a teacher to try and make each and every passage “applicable”, it was fun to watch students make connections between then and now themselves. All in all, I am so glad that I was made aware of Immerse: The Reading Bible and can’t wait to keep exploring ways to integrate it into my other classes, refining and honing my own skills as a teacher to help open up the Bible to students, and in turn being blessed by what they teach me through this experience of reading communally. This week our team is celebrating the completion of Immerse: The Reading Bible, a project we’ve been working on with our partners at Tyndale House Publishers for the past eighteen months. 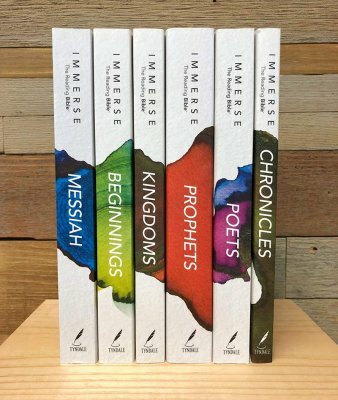 Immerse: Prophets arrived from the printer in late February and rounded out the six-volume set, which represents our best work yet in the “reader’s edition” Bible category. We used scientific research on the length of the reading line, number of characters, margin size, and font size to find the optimal balance for the most comfortable reading experience. The first two volumes, Messiah and Beginnings, have already found significant traction within churches across North America as part of the Immerse: The Bible Reading Experience church campaign. “Immerse is spreading organically from church to church as early adopters tell stories about positive experiences reading Immerse: Messiah,” said Doug Knox, Sr. Vice President and Group Publisher at Tyndale. The Spanish edition of Immerse, Inmersión: La Biblia de lectura, is close behind the English version. Four of the six volumes have been printed, with the last two scheduled for completion later this year. All of the church campaign materials have been translated as well. While the Bible itself is finished in English, much work remains to complete the accompanying church campaigns for all six volumes. We are raising money to produce the preview videos that go along with each week’s reading and help the reader become familiar with the historical and literary context of what they’re about to read. Messiah and Beginnings videos are finished, but we still need to create videos for the final four campaigns — 32 videos total. These videos are an integral part of the Immerse experience. If you’d like to support our work to finish them for all six volumes, we’d really appreciate if you head over to our Donate page and make a gift. Thanks so much! The Institute for Bible Reading is committed to putting our research and perspective into action by creating real resources for churches to help their congregations read the Bible well. We’re proud to announce what we believe is our best work yet. Immerse: The Bible Reading Experience, featuring the new six-volume Immerse: The Reading Bible, is the first initiative from our alliance with Tyndale House Publishers announced in February. This fall, churches across America are invited to take a deep dive into the Scriptures with the Immerse: Messiah (New Testament) or Immerse: Beginnings (Torah) campaigns. The Bible Reading Movement is happening. Join the movement! CAROL STREAM, Ill. (May 4, 2017) – Tyndale House Publishers announces Immerse: The Bible Reading Experience, ™ a bold new campaign to help communities of believers truly know and understand the Bible. Participants will use Immerse: The Reading Bible,™ a new six-volume reading Bible developed by the Institute for Bible Reading and Tyndale. This innovative new Bible features today’s most readable Bible translation, the Holy Bible, New Living Translation. Each of the six volumes provides the base for an eight- week reading experience. With one eight-week reading experience in the fall and another in the spring, participants will establish an ongoing three-year rhythm of Bible engagement.